How do you order Otrivin Cold & Allergy online? You can order Otrivin Cold & Allergy online from YouDrugstore. 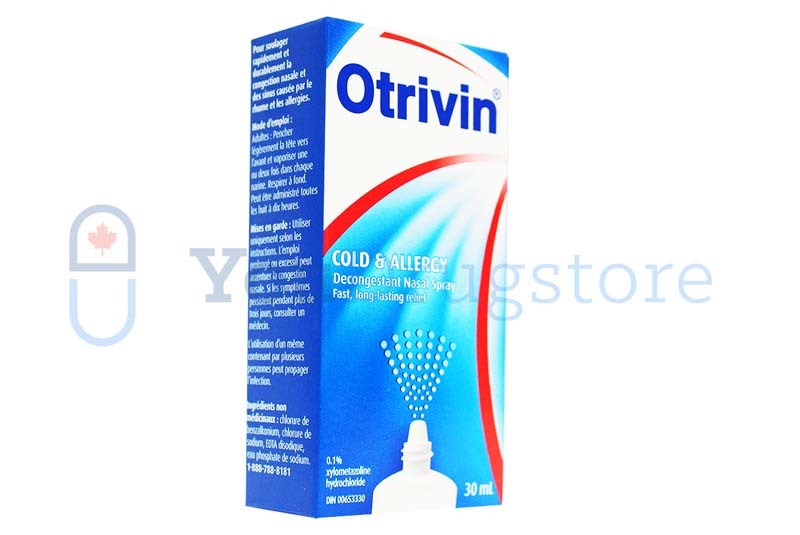 We are an online Canadian pharmacy where you can buy Otrivin Cold & Allergy at a discount price. Simply click the register button at the top of this page, or give us a call toll free at 1-855-968-6337 to place your order. Once we have received all of the necessary information from you, your order will be shipped out within 48 hours. When you purchase low cost Otrivin Cold & Allergy from YouDrugstore we ship your order directly to your house for a cheap cost in shipping. We even offer free shipping on any order over $100. Otrivin Cold & Allergy is a non-prescription nasal spray used to treat nasal congestion. 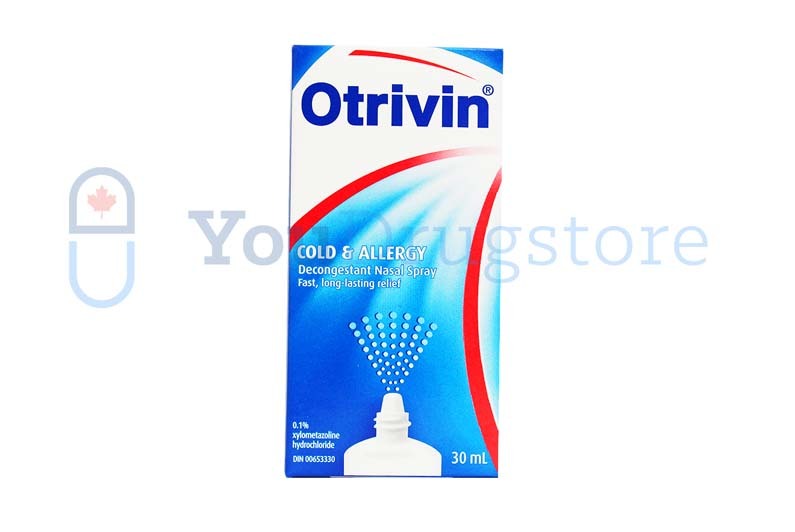 Buy cheap Otrivin Cold & Allergy from YouDrugstore today and treat nasal congestion as soon as possible. What are the side effects of using Otrivin Cold & Allergy? Otrivin Cold & Allergy does not typically cause any side effects. The most common side effects that are reported include a burning, stinging, or tingling feeling when the nasal spray is first used, dryness in the nostrils, fluid discharge from the nose, and sneezing. Typically, these side effects can be ignored unless they become severe. Contact your doctor if you experience any side effects that are severe or disrupt your daily functioning. Although it has only happened in very rare cases, there are reports of blurred vision, lightheadedness, shortness of breath, wheezing, trouble sleeping, and nausea. Speak to your doctor if you experience any of these side effects. If you have any concerns about using Otrivin Cold & Allergy nasal spray talk with your doctor. When should you use Otrivin Cold & Allergy? Otrivin Cold & Allergy is used when nasal congestion is present. It is recommended that you only use Otrivin Cold & Allergy once every 8 to 10 hours. To use Otrivin Cold & Allergy nasal spray tilt your head forward, spray once or twice into each nostril, and breathe deeply through your nose. Do not use Otrivin Cold & Allergy long term or excessively. Long term or excessive use of Otrivin Cold & Allergy may actually cause an increase in nasal congestion. If your nasal congestion lasts for longer than 3 days when using Otrivin Cold & Allergy call your doctor. Do not share your Otrivin Cold & Allergy bottle with anyone, even family members. Sharing Otrivin Cold & Allergy can spread and cause infections. If your doctor has recommended you use Otrivin Cold & Allergy in a particular way always follow their instructions over all others. Why is Otrivin Cold & Allergy recommended to treat nasal congestion? Otrivin Cold & Allergy contains a generic medication called xylometazoline, which is a safe medication listed on the World Health Organization's list of most essential medicines required for a basic health care system. It is a decongestant that works by constricting the blood vessels in your nose. Nasal congestion is caused by the inflammation of the same blood vessels. By constricting them, Otrivin Cold & Allergy gives you room to breathe. This bottle of Otrivin Cold & Allergy comes in 0.1% strength, which is significantly stronger than the Otrivin Allergy & Cold Mild Formula, and helps clear up tough nasal congestion. Order Otrivin Cold & Allergy from YouDrugstore and get powerful treatment for nasal congestion. Who can use Otrivin Cold & Allergy? Anyone above the age of 2 years old can use Otrivin Cold & Allergy nasal spray. Be aware that you must tell your doctor if you are pregnant or breast feeding before using Otrivin Cold & Allergy. You should avoid Otrivin Cold & Allergy nasal spray if you have a history of heart trouble. Do not use Otrivin Cold & Allergy nasal spray if you are allergic to it or any of its ingredients. If you have any questions or concerns about using Otrivin Cold & Allergy call your doctor. Where can I learn more about Otrivin Cold & Allergy?